XXXXVIII Panzer Corps (also: XXXXVIII Army Corp or XXXXVIII. 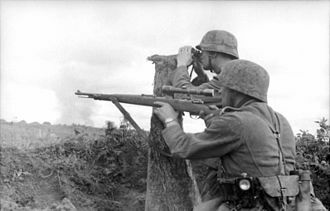 Armeekorps)[note 1], was a corps-level formation of the German Army which saw extensive action on both the eastern and western fronts during World War II. The corps was originally formed on 15 December 1940 in Germany. 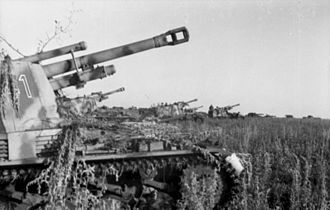 At the dawn of Operation Barbarossa, on 22 June 1941, it was redesignated as the XXXXVIII Panzer Corps. 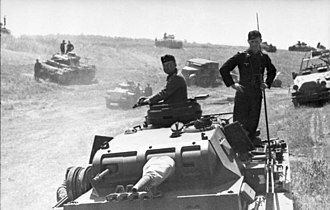 The Corps was attached to Field Marshal Ewald von Kleist's Panzer Group 1, a part of Army Group South. 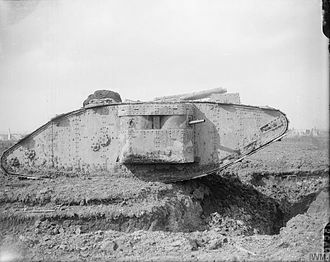 The corps took part in the Battle of Brody early in the campaign, and later saw action at Berdichev and Kirovograd. 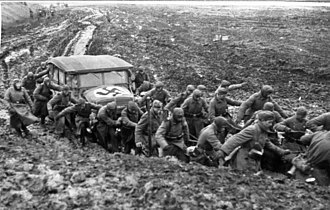 As all German Corps on the Eastern Front, the XXXXVIII Corps implemented the criminal Commissar Order. 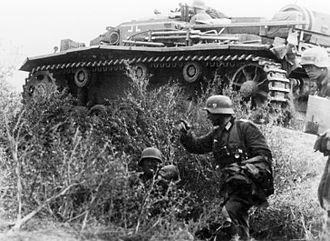 From late 1941 to May 1942, the corps took part in defensive operations in the Kursk area. 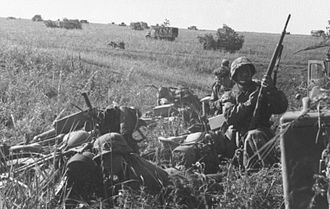 Thereafter the corps joined the Fall Blau offensive towards Stalingrad under Army Group B. 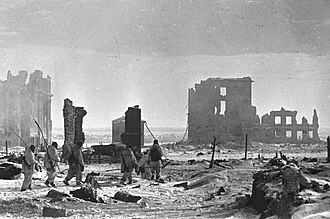 During the Battle of Stalingrad the corps was trapped and its major units, 22nd Panzer Division and 1st Armoured Division (Romania), were destroyed. 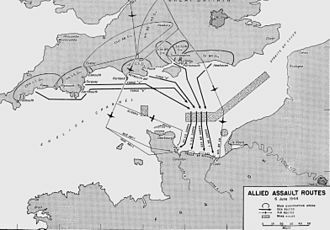 However, it was quickly reformed and used by Field Marshal Erich von Manstein's Operation Winter Storm efforts to relieve General Friedrich Paulus' trapped Sixth Army still in Stalingrad. 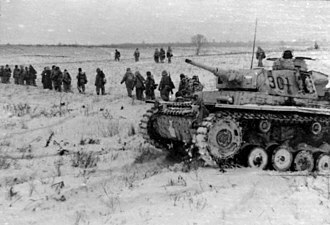 In February 1943, the XXXXVIII Panzer Corps took part in the battles around Kharkov, and in June it was committed to the southern flank of the Battle of Kursk as part of Hoth's Fourth Panzer Army. After the failure of Operation Citadel the corps took part in the retreat from Ukraine. By February 1945, the corps found itself in Silesia, and it ended the war defending the Elbe River, where it surrendered in May 1945. ^ Stahel 2015, p. 28. Walther Nehring was a German general in the Wehrmacht during World War II who commanded the Afrika Korps. Nehring was born on 15 August 1892 in Stretzin district of West Prussia, Nehring was the descendant of a Dutch family who had fled the Netherlands to escape religious persecution in the seventeenth century. His father, Emil Nehring, was an owner and officer of the Military Reserve. While Nehring was still a child the family moved to Danzig, Nehring joined the military service on 16 September 1911 in the Infanterie-Regiment 152. He became a commissioned Leutnant on 18 December 1913, between November and December 1942, he commanded the German contingent in Tunisia. 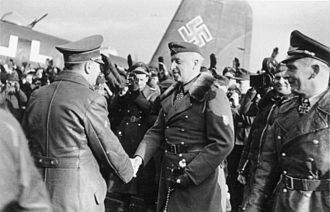 After North Africa, Nehring was posted to the Eastern Front where he commanded first the XXIV Panzer Corps, Nehring returned to the XXIV in August 1944 and led the Corps until in March 1945 when he was made commander of the 1st Panzer Army. 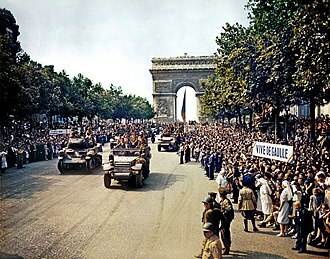 During 1944 he was the officer of the XXXXVIII Panzer Corps. Following the end of the war, Nehring wrote a history of the German panzer forces from 1916 to 1945. Heinrich Eberbach was a General der Panzertruppe in the Wehrmacht during World War II. He was a recipient of the Knights Cross of the Iron Cross with Oak Leaves, heinrich Eberbach was born on 24 November 1895 in Stuttgart, the German Empire. Eberbach graduated with his Abitur on 30 June 1914, on 1 July 1914, Eberbach joined the Army of Württemberg. With the outbreak of World War I, Eberbachs unit was deployed on the Western Front, on 16 October 1914, Eberbach was wounded in his thigh by artillery shrapnel. In September 1915, Eberbach was severely wounded, losing his nose, during the 1920s Eberbach was a police officer, in 1935 he joined the Wehrmacht. In 1938 Eberbach became commander of a Panzer regiment, in the newly formed 4th Panzer Division under Generalmajor Georg-Hans Reinhardt, Eberbach participated in the German Invasion of Poland in September 1939 and in 1940 in the Battle of France. His unit supported General Manteuffels offensive across the Meuse River in May, shortly after the start of Operation Barbarossa in June 1941, he was assigned as commander of the 5th Panzer Brigade in Leo Geyr von Schweppenburgs XXIV Panzer Corps. During Operation Typhoon, Eberbach spearheaded Panzer Group 2s offensive towards Moscow as the commander of a combined-arms kampfgruppe within the 4th Panzer Division, Kampfgruppe Eberbachs losses had been light,6 tanks knocked out,34 men killed and 121 wounded. This was a price to pay for the complete rupturing of the Soviet lines. 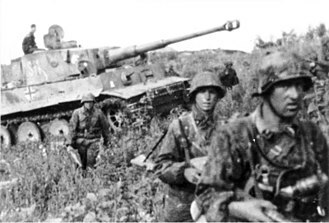 4th Panzer division had captured 1,600 Soviet troops, in March 1942 he was made commander of the 4th Panzer Division, in the German lines opposite the Russian town of Sukhinichi, roughly 120 miles west of Tula. In late November 1942 Eberbach was appointed commander of the XLVIII Panzer Corps that had just been overrun in the days of Operation Uranus. Eberbach was soon wounded and evacuated, remaining hospitalized until February and he became Inspector of the Armored Troops in the Home Army, was awarded the Knights Cross of the Iron Cross and promoted to Lieutenant General. In November 1943 Eberbach became commander of troops around Nikopol and fought in battles around Zhitomir in the Soviet Union, in early 1944 Eberbach was promoted to the rank of General der Panzertruppe. The Commissar Order was an order issued by the German High Command on 6 June 1941 before Operation Barbarossa. Its official name was Guidelines for the Treatment of Political Commissars and it instructed the Wehrmacht that any Soviet political commissar identified among captured troops be summarily executed as an enforcer of the Judeo-Bolshevism ideology in military forces. According to the order, all prisoners who could be identified as thoroughly bolshevized or as active representatives of the Bolshevist ideology should be killed. Planning for Operation Barbarossa began in June 1940, on March 3,1941 Hitler explained to his closest military advisers how the war of annihilation was to be waged. Hitler declared, The intelligentsia established by Stalin must be exterminated, the most brutal violence is to be used in the Great Russian Empire. 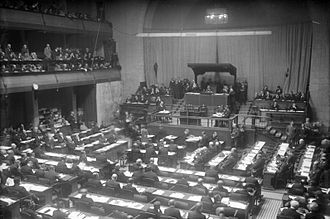 On March 30, Hitler addressed over 200 senior officers in the Reich Chancellery, among those present was Halder, who recorded the key points of the speech. 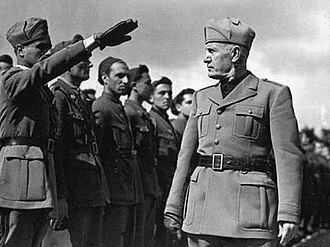 He argued that the war against the Soviet Union cannot be conducted in a knightly fashion because it was a war of ideologies and he further declared that the commissars had to be liquidated without mercy because they were the bearers of ideologies directly opposed to National Socialism. Hitler was well aware that this order was illegal, but personally absolved in advance any soldiers who violated international law in enforcing this order and he erroneously claimed that the Hague Conventions of 1899 and 1907 did not apply since the Soviets hadnt signed them. In fact, Russia had signed both conventions, the paragraph in which General Müller called for Army commanders to prevent excesses was removed on the request of the OKW. Brauchitsch amended the order on 24 May 1941 by attaching Müllers paragraph, the final draft of the order was issued by OKW on 6 June 1941 and was restricted only to the most senior commanders, who were instructed to inform their subordinates verbally. 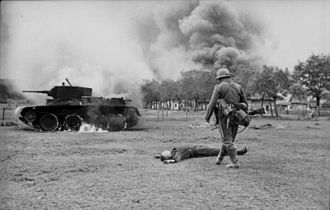 The vast majority of the Wehrmacht officers and soldiers tended to regard the war in Nazi terms, the enforcement of the Commissar Order led to thousands of executions. 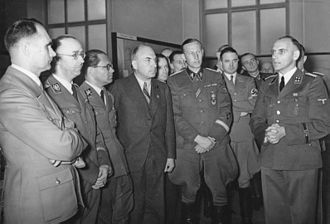 Every German general enforced the Commissar Order, erich von Manstein passed on the Commissar Order to his subordinates, who executed all the captured commissars, something that he was convicted of by a British court in 1949. After the war, Manstein lied about disobeying the Commissar Order, saying he had opposed to the order. 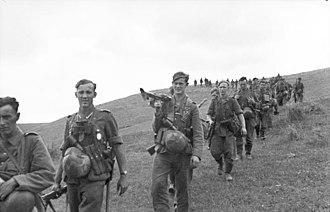 When the Commissar Order became known among the Red Army, it delayed or prohibited surrender to the Wehrmacht and this unwanted effect was cited in German appeals to Hitler, who finally cancelled the Commissar Order after one year, on 6 May 1942. Commando Order Severity Order Nazi crimes against Soviet POWs German High Command orders for Treatment of Soviet Prisoners of War Burleigh, 1st ed. Cambridge, Cambridge University Press,1997. 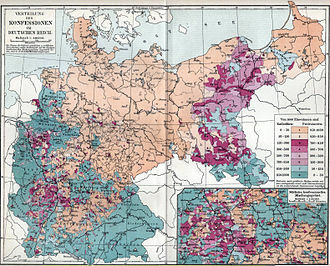 Jürgen Förster, Das Unternehmen Barbarossa als Eroberungs- und Vernichtungskrieg, in, Germany and the Second World War. The German Militarys Image of Russia, Alex J. Exploitation, Mass Murder, Political And Economic Planning for German Occupation Policy in the Soviet Union, 1940-1941. Berdychiv is a historic city in the Zhytomyr Oblast of northern Ukraine. Serving as the center of the Berdychiv Raion, the city itself is of direct oblast subordinance. 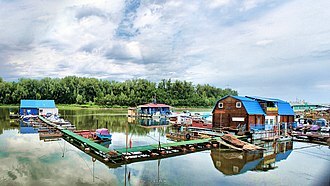 It is located 44 km south of the oblast capital, however the etymology of the name Berdychiv is not known. In 1483, Crimean Tatars destroyed the settlement, during the 1546 partition between Lithuania and Poland, the region was listed as a property of Lithuanian magnate. 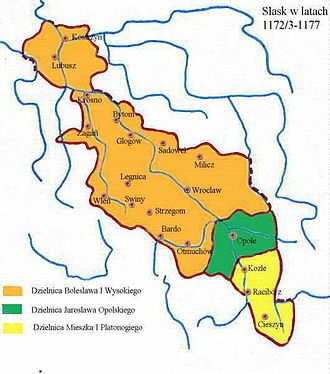 According to the Union of Lublin, Volhynia formed a province of the Polish-Lithuanian Commonwealth, the fortified Carmelite monastery and plundered by Bohdan Khmelnytsky in 1647, was dissolved in 1864. In 1764, Kazimierz Pulaski defended the city with his 700 men surrounded by army during Bar Confederation. The town underwent rapid development after king Stanisław August Poniatowski, under pressure from the powerful Radziwiłł family and this made Berdychiv one of the most important trading and banking centers in the Polish-Lithuanian Commonwealth, and later, the Russian Empire. At the time, the saying Pisz na Berdyczów, because of the phrase being used in a popular poem by Juliusz Słowacki, Pisz na Berdyczów. Acquired a second meaning as a brush-off, send me a letter to nowhere or leave me alone, the banking industry was moved from Berdychiv to Odessa after 1850, and the town became impoverished again in a short period of time. 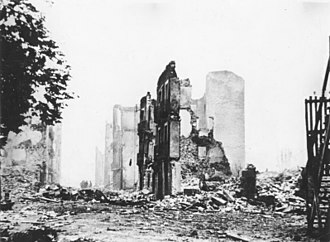 In 1846, the town had 1893 buildings,69 of which were brick-made,11 streets,80 alleys, honoré de Balzac visited it in 1850 and noted that its unplanned development made it resemble the dance of a polka as some buildings leaned left while others leaned right. 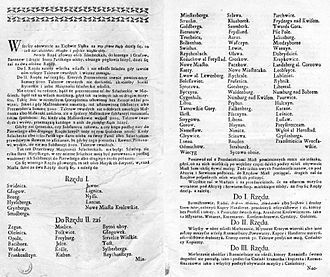 According to the census of 1789, the Jews constituted 75% of Berdychivs population, in 1797, Prince Radziwill granted seven Jewish families the monopoly privilege of the cloth trade in the town. By the end of the 18th century, Berdychiv became an important center of Hasidism, in its heyday, Berdychiv accounted some eighty synagogues and batei midrash, and was famous for its cantors. Berdychiv was one of the centers of the conflict between Hasidim and Mitnagdim, as the ideas of Haskalah influenced parts of the Jewish communities, a large group of Maskilim formed in Berdychiv in the 1820s. At Trent Park POW camp.